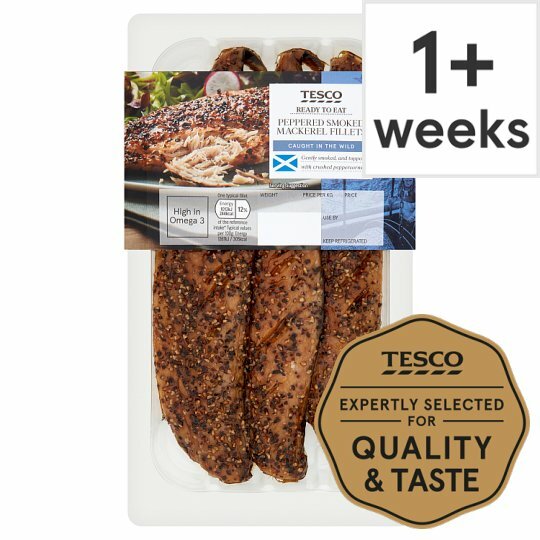 Hot smoked mackerel (Scomber scombrus) fillets with crushed peppercorns. Mackerel (Fish) (96%), Salt, Pepper. Contains fish and mackerel.For allergens, see ingredients in bold. Instructions: Place under a pre-heated grill for 6 minutes. Turn once. This product is ready to eat, but may also be eaten hot.For extra succulence, remove from fridge 15 minutes before eating.